Consumer durables retail sales in the US increased 3.8% in 2017, with online sales growing by more than 10%. The share of e-commerce amounted to 13% of total retail sales in 2017, increasing from 11.6% in 2016, and represented about 50% of all retail sales growth in 2017, with the bulk of gains stemming from growth of web leader Amazon.com Inc. 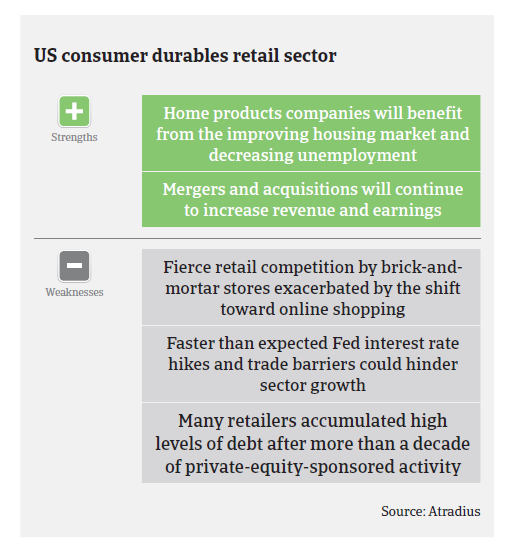 The 2018 outlook for US consumer durables sales remains positive, due to robust private consumption driven by an improved housing market, job growth and higher wages. Total sales are expected to grow by about 4.5% this year, with e-commerce increasing by 15%, while in-store sales are forecast to increase 3%. Downside risks for this outlook are faster than expected interest rate hikes that could hamper consumer spending, while trade restrictions imposed by the US administration could increase prices for imported consumer durables goods. The US household appliances segment is expected to grow further in the coming years, with sales to increase to USD 115 billion in 2020 (from USD 84.43 billion in 2014). The US furniture market has been growing since 2009, and furniture sales are expected to continue to increase in 2018, supported by a benign economic environment with higher disposable income, supporting home sales and home furnishing expenditures increase. US furniture sales are forecast to reach USD 122 billion by 2020, a 3% compound annual growth rate. While online sales are rising in this segment, many consumers still prefer to research online but purchase in-store. Revenues in the consumer electronics segment are expected to amount to USD 69.3 billion in 2018, with an annual growth rate of more than 6% in the coming five years, resulting in a market volume of USD 90 billion in 2022. 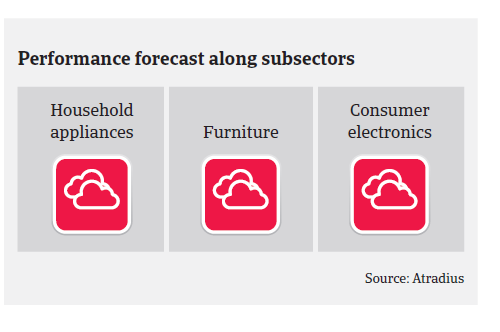 That said, smaller consumer durables retailers, in particular, will continue to face a very competitive environment with low net margins compared to other industries. E-retailing is expected to remain fast growing and to shift the retail landscape, increasing its share of total sales to 20% within the next seven years. At the same time consumer habits are changing, with spending on durable goods as a percentage of total personal consumption expenditures decreasing. Instead, there is a marked increase in purchases of accommodations, recreation, and other experience-related products and services. Payments in the US retail sector take 60 to 90 days on average and the number of non-payment notifications has been stable over the past 12 months, with no major increase expected in 2018. However, the insolvency level in the industry is high (retail business failures accounted for more than 10% of total filings in 2017). It is expected that retail insolvencies will increase further in 2018 and that the number of store closures will remain overly high – despite the generally robust sales performance. Reasons for this negative development are the overwhelming online competition as well as shifting consumer preferences. The main cause is that many long-standing chains are highly indebted, often from leveraged buyouts led by private equity firms. 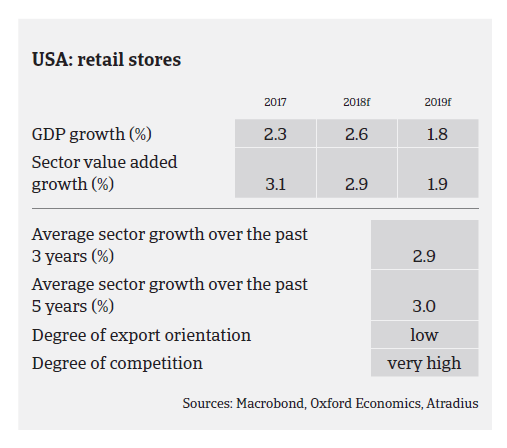 There are billions in US dollar debt on the balance sheets of troubled retailers and sustaining that burden is increasingly difficult, even for healthy retail chains. So far struggling retailers have largely been able to avoid bankruptcy by refinancing to buy more time. But the market sentiment has shifted, pushing investors to reconsider lending to the industry, coupled with the burden of rising interest rates. The situation is expected to remain difficult in the coming years, with a high amount of risky debt owed by retail coming due over the next five years. Just USD 100 million of high-yield retail borrowings were set to mature in 2017, but that will increase to USD 1.9 billion in 2018 and to an annual average of almost USD 5 billion between 2019 and 2025. 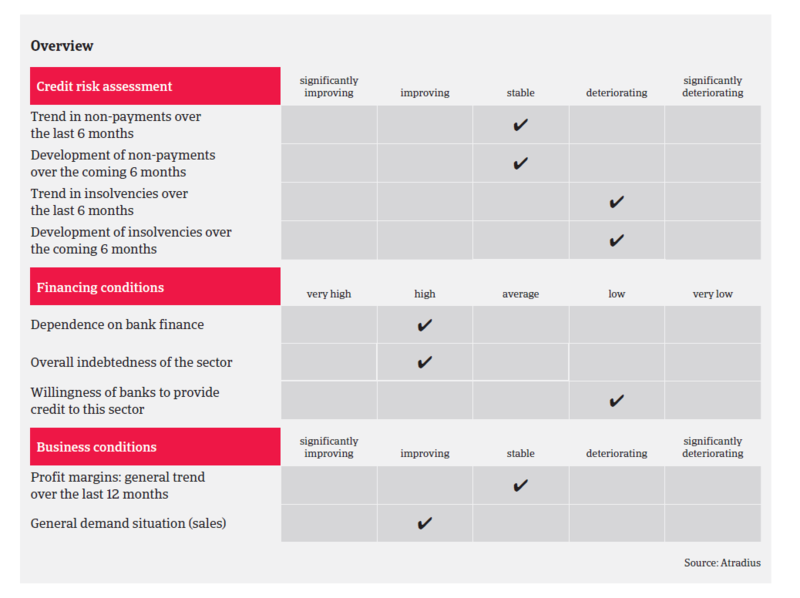 Therefore, our underwriting stance is neutral to cautious, as, despite the general sales upswing, many retail businesses continue to struggle with high levels of debt.